I am so excited to be a guest on Sweet Lavender Bake Shoppe’s blog. Christina’s blog is always beautiful to visit. 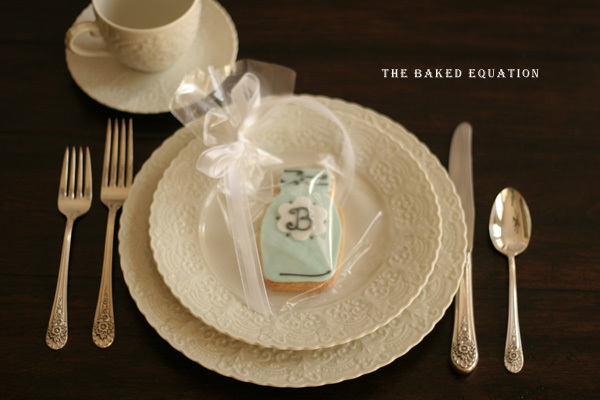 Let me introduce myself, my name is Melissa and I have a custom dessert company called The Baked Equation. My little company was born as a way to raise funds for our charity Micah 6:8 Sudan. When Christina asked me to do a guest post, I was thrilled. I started blogging in October of last year. Can you believe it? It is going to be my bloggy birthday on October 18th. I was so nervous diving into a world of amazing talent. Have you seen the dessert blogs out there? They are incredible and sometimes a little intimidating but I am so glad I decided to take a risk. The best part is meeting people like Christina along the way. Those amazing people I have met by having a blog is something to be treasured. I thought I would share something with you that I love: mason jars. I love vintage things. Mason jars make the perfect gift. There are so many things you can do with them. You can dress them up or dress them down and they are still perfect for any party. Mason jar gifts fit into any occasion, from an upscale wedding to a back yard barbecue. So let’s get started. 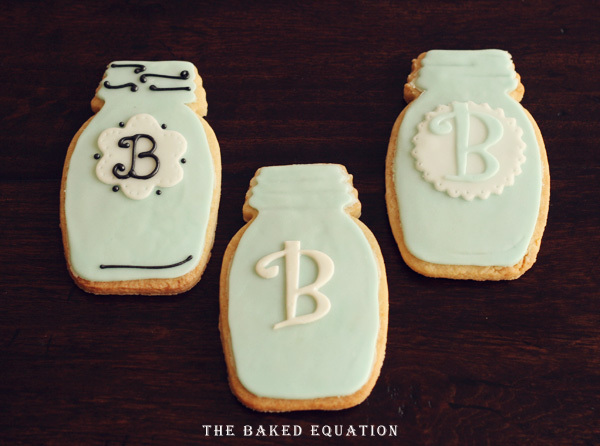 I will take you step by step through the process to create a mason jar sugar cookie favor. 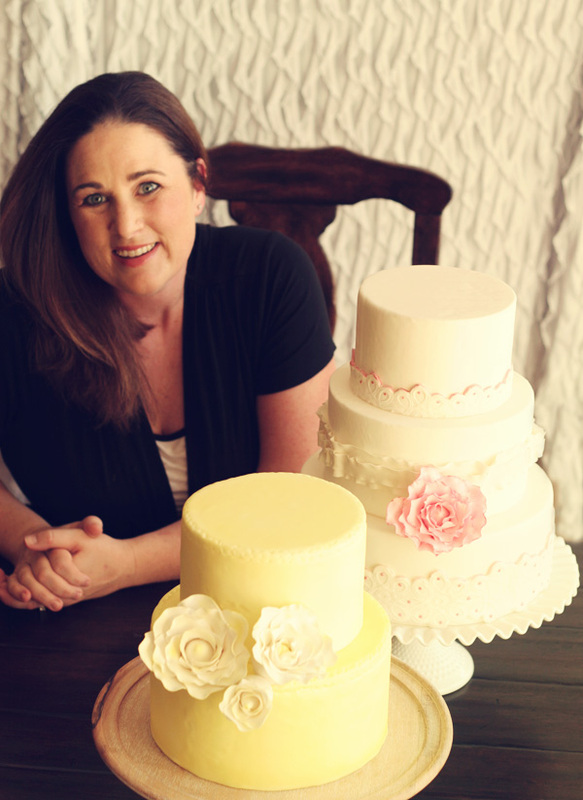 Let’s talk about fondant. Not all fondant is created equal. I have searched high and low for a good quality fondant. I use Carma Massa Ticino because it is very easy to work with and it actually tastes good but it can be pricey. The other brand I would recommend using is Satin Ice. Cookies are much more forgiving than covering a cake in fondant, so you can make your own. One of my favorite homemade fondant recipes is by Haniela’s. Step 1: Take a small amount of fondant. Knead the fondant to make it pliable. When kneading fondant it is best to place a small amount of shortening on your work surface. This helps the fondant to keep from sticking. An easy tip to remember when working with fondant is when kneading fondant use shortening and when rolling out fondant, use cornstarch. Step 2: Add your color to the fondant. Pick out the color for the base of your cookie. I chose teal to give the mason jar the vintage look. 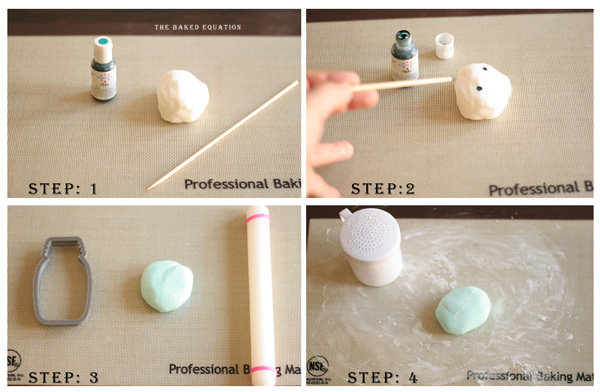 Take a clean skewer or toothpick and place a small amount of color in the fondant. Knead color into the fondant until evenly distributed. Step 3: Now that your fondant is evenly colored it is time to roll it out. Grab your rolling pin with spacers. To cover cookies I roll out to 1/16th of an inch. The pink spacers on the rolling pin take all the guess work out of it. Step 4: Lightly dust your work surface with cornstarch. Place ball of fondant in the center. Roll out like you would a pie crust. Turn the fondant a ¼ turn after each roll. 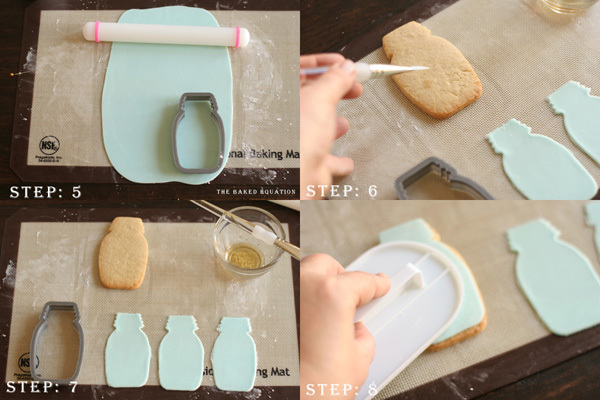 Step 5: Take your mason jar cutter and cut out your shapes. When you place the cutter on the fondant push down firmly and move back and forth slightly. This helps create a clean edge. Take the left over scraps of fondant, roll into a ball and roll out again. Keep doing this process until you have all your cookies covered. If you have left over fondant, roll into a ball, wrap in plastic wrap and then place it in a plastic bag tightly sealed. Fondant will keep for months. Step 6: I let my fondant sit for a few minutes. Fondant is very pliable and it can stretch when you are picking it up. Letting the fondant sit for a few minutes helps alleviate that problem. 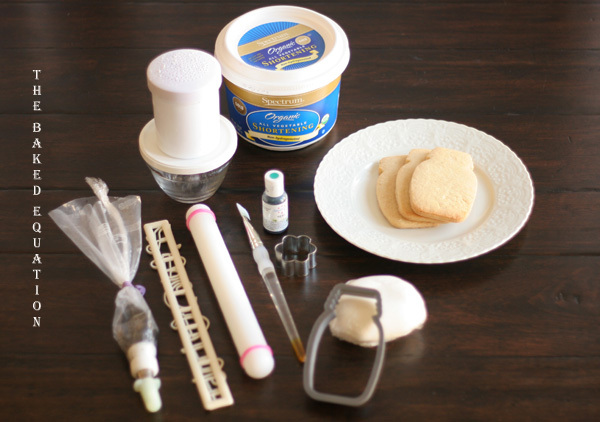 Step 7: Brush vanilla onto the cookie. Then center your fondant on the cookie. Step 8: Smooth fondant on the cookie with the fondant smoother using very gentle pressure. 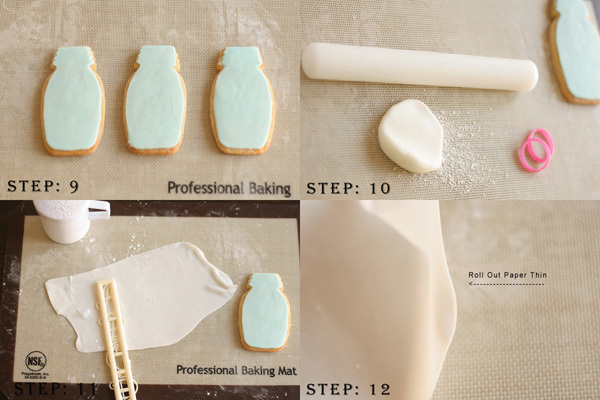 If your cookie is a bit misshaped you can use the fondant smoother to stretch out the fondant to create the right border. Step 9: Let the fondant sit for a while on your cookies. This allows the fondant to harden a little. Step 10: Get a small ball of fondant. Lightly dust your work surface with corn starch. You can use white or a complementary color in your color scheme. Take the spacers off the fondant roller. See the picture labeled 12; you want the fondant paper thin. Dust the top of your fondant with cornstarch as well to help keep your letters from sticking. Any fondants you are not using right away keep under a layer a plastic wrap or covered. This will keep your fondant from drying out too quickly. Step 11: Place the letter of the tappits firmly on the fondant. Wiggle back and forth while placing pressure. Step 12: Visual of paper thin fondant. Step 13: Sometimes the tappit letter will just fall out of the mold. If it does not you can take a tooth pick or skewer to remove it. I like to use a skewer because it has a flat end on the opposite side. In the open space gently press against the fondant to remove it. If the letter loses its shape when you are removing it from the mold gently reshape. Since it is fondant it has some give to it. You do not have to use tappits. You can use any letter cutter to make the monogram. Step 14: Turn letter over. Place a small amount of clear vanilla on a brush and apply to the letter. Turn the letter over and adhere to the cookie. Step 15 (Optional): Take a dry, clean brush and dip it in luster dust. This adds a pretty sheen to your cookies. Let the cookie dry for about 6 to 8 hours before bagging. Place in a cellophane bag with ribbon. Step 16: For those who want to take the mason jar cookies a step further you can use all different types of cutters to be the background for the monogram. On one cookie I used a simple round fluted cutter and on another cookie I used a small flower cutter. Roll out a thin layer of fondant. 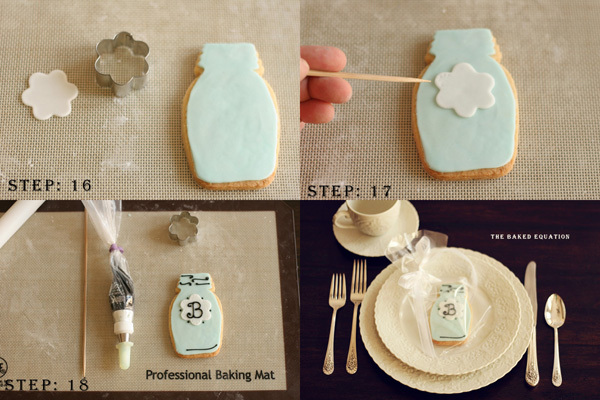 Cut out flower shape and place on the cookie. Step 17: Take your toothpick/skewer and line the edges with little dots. 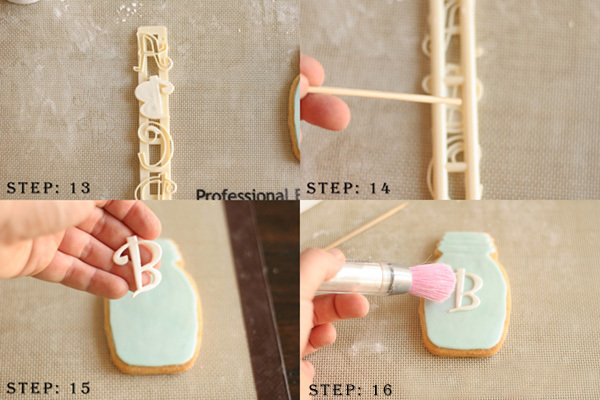 Step 18: Instead of using fondant as your monogram, you could make royal icing and pipe on the letter. You can also use the royal icing to make details on the lid and bottom of the jar. Let the cookies sit for 6-8 hours before bagging. I hope you enjoyed the mason jar cookie tutorial. Remember have fun with it. These are just guidelines for helping you make it. If you make some you will have to drop by our facebook page and show us a picture. Thank you so much for having me over Christina. You're so welcome Melissa!!! What a fantastic tutorial! This couldn't be more easy to understand. I'm also thinking baby showers and engagement parties as well as wedding favors! What a nice little handmade gift to give! I'm pinning this one, for sure!